Then you’re probably looking to expand your reach for maximum exposure! Pinterest is an incredible tool for blogging, isn’t it? Maybe you’re even already aware that it has more than 250 million active users a month! But did you know that Google gets 3.5 billion search queries every single day? This figure is astronomical, isn’t it? And while 81% of Pinterest Users are female, Google users are more likely to be male than those who use Bing and Yahoo (Check out this study by Further to learn more on search demographics). Talk about diversifying your audience! The first key to generating blog traffic is visibility. And in order to be visible in search results, you’re going to want to start working on your Google Search Ranking! What Is Google Search Console And How Can It Help? Google Search Console (GSC) is a powerful tool that allows you to learn an enormous amount of information about your website’s performance as well as your audience. So, let’s start by setting you up with Google Search Console and then explore how you can use this powerful tool to increase your Google Search Ranking using a few of the above ideas. We’ll even do a breakdown of some essential terms! Copy the Google Analytics tracking code that you already use on your site; by far the simplest verification method if you’ve already synced Google Analytics to your site! 7. If your site supports both an http:// and an https:// version, be sure to add all variants to your properties. Isn’t nikkiblogs.com the same domain as www.nikkiblogs.com? Actually, no! Each one represents a different server. 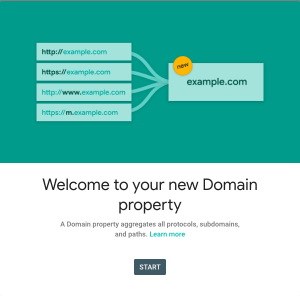 While the URLs might look VERY similar, they are indeed two different domains. But if you type www.nikkiblogs.com into your browser bar, you’ll end up on https://nikkiblogs.com! If you have NOT set a canonical URL, Google could treat the non-www version and the www version of your domains as separate entities. This means your page views, any of your internal links, and even engagement would be split into two separate groups. Ugh! By April 10, 2019, Google intends to transition all performance data so that Google Search Console will assign search metrics to Google-Selected canonical URLs rather than URLs that have been referred to by Google Searches. For more information about these changes, please continue reading here. If you’re a WordPress User, you can quickly and easily build a sitemap by installing the Sitemap Generator Plugin. Once installed, simply click Generate your sitemap to create an XML sitemap for your blog. Now, head over to Google Search Console. Under Add a new sitemap, type /sitemap.xml into the field that reads Enter sitemap URL. Congratulations! You have a Sitemap. The following are a few basic terms that you should know in order to use Google Search Console as effectively as possible. Query: A search query that triggered an impression. Impression: How many times a user saw a link to your site within their search results. Click: How many times a user clicked on your site. Average Position: the average ranking of your site’s URLs in search results; based on the highest position whenever it appeared in a user’s search. Click Through Rate (CTR): the percentage of impressions that resulted in a click on your site; click/Impressions x 100. There are a few different options for viewing your data on GSC. The vast majority of my traffic comes from the web (and especially Pinterest) but, if you are receiving a large number of views from images or videos, make sure to adjust this filter to suit your needs. You can also compare two types of traffic by clicking on the Compare tab after you have selected the two categories you want to face off. When you’re ready, just click Apply to see how they line up. Google Search Console can provide you with up to 16 months of data for your blog. Choose from pre-determined time periods like 7 or 28 days, or even set a custom range that you have determined for yourself. Just like we did above with Search Type, you can even compare two date ranges by selecting the Compare tab here. Consider layering your filters for an even more in-depth analysis as well. For example, want to know how many people find you using the query “Instagram Caption Ideas” on mobile devices? Add a filter for that Term using the Query tab and select Mobile in the Device tab! Now, let’s practice using Google Search Console for a few of the more advanced ideas we talked about earlier. Change the Date Range to fit your needs: For example, when you started your blog or when you started blogging full-time might give you a good idea about how your site has improved over that duration! Clicks should be displayed in descending order so that you are viewing your posts and pages from most popular onward. Change the Date Range to fit your needs. Click Average CTR above the graph. Click CTR within the Queries tab to display data in descending order and see your top performing posts and pages first. Pro Tip: It’s especially useful to view CTR alongside your Impressions data! For example, some pages may have a high impression count but low CTR. Use the data from your Queries to make posts and pages more enticing to viewers. Improve the Titles and Meta-Descriptions of your posts to align better with the Queries that are bringing you the most Impressions. Click the Date Range to adjust for the time period of your choice. Click Position within the Pages tab twice to display results in ascending order. Since you’re viewing average positions by URL, the number you see here is the mean of all of that page’s rankings. For example, if you rank first overall for a low-volume query and ninth for a high-volume one, your average ranking would still be fifth. The Queries tab should be selected by default. Choose from the given options or set your own custom start and end dates to compare two equivalent time periods. Scroll down to the Queries Tab. Clicks should be selected by default and will display the Queries that have led to your site most often first. Click on Impressions to compare the results and see how you can better optimize pages that rank for these Queries! Above the graph, select Total Clicks, Total Impressions, Average CTR, and Average Position to display all details. 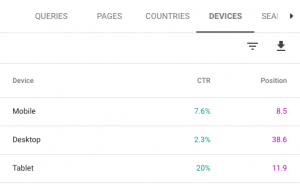 Have a look at how your site performs across Desktop, Mobile, and Tablet. 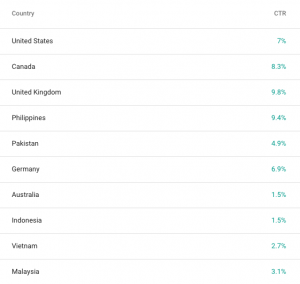 Have a look at how your site performs in different countries! From the Performance page, click on the Overview tab at the left of your screen. Have a look at your Valid Pages count here. Click Open Report for more details. Click the Links tab in the lefthand menu of your Google Search Console window. Open the Top Linked Pages report by clicking More at the bottom of the box. The number of Total Internal Links will be displayed in a box at the top lefthand corner of your browser. Pages should automatically be displayed in descending order. Scroll down to Top Linking Sites and click the More tab. Have a look and see how who’s linked to your blog! Are there a couple of other bloggers just like you there? Awesome! How flattering and exciting, right? Consider offering to do a Guest Post on their site and vice versa in addition to seeking them out on Social Media. Where are my Instagram Influencers at? Think future joint Giveaways and #WomanCrushWednesday features! Which method did you choose for verifying your site on Google Search Console? Were you surprised by any of the Queries that were leading people to your blog? How about creating a Sitemap? I’d love to hear about your experience with GSC in the comments below! Are you ready to take your blog or business to the next level? Then it’s time to start branding! And whether you’ll use them to create your website banner, logo, or business cards, hand-lettered fonts are always a great idea for branding. Add a component of your authentic self to you personal profile or website and choose one or a few that reflect your personality. Using hand-lettered fonts is one of my favourite ways to personalize my pins on Pinterest and my Instagram stories. Rather than the standard fonts you’ll find on Canva or on your computer, choose a unique one to stand out from the crowd. For an absolutely beautiful and feminine touch, also consider using these fonts in your header or throughout your blog posts as sub-headings! Below you’ll find a collection of my absolute favourite hand-lettered fonts. Gorgeous and minimalist, these looks are sure to please. Please note that some of the links below are affiliate links and, should you choose to purchase a product using one of them, I could make a small commission at no additional cost to you. So, why don’t we get started. Let’s check them out and find your new go to font! Have you incorporated custom hand-written fonts into your brand yet? How did you do it? Share your ideas and experience with personalizing your brand in the comments below! Disclaimer: This post contains affiliate links meaning that should you make a purchase using one of these links, I will earn a small commission at no additional cost to you. I have not recommended any products here due to these small commissions and only display items that I truly enjoy or find beautiful on my site! One of the most important blogging decisions you will ever be faced with is your choice in theme! Do you want something more minimalist? Feminine? Chic? Or maybe depending, on your content, a theme that caters better to images than text, or one that is WooCommerce-ready if you’ll be setting up an online shop! Deciding on your theme could take anywhere from a few hours to days. But of course, this all depends on how specific your tastes are… although there really are countless options out there. Write down the specifics of what you want your blog to look like and make sure to have a checklist with you when you’re narrowing it down. The themes below are all meant for WordPress.org and are all available through Creative Market (my go to destination for anything blog or social media related). If you haven’t already, be sure to setup a self-hosted WordPress site before purchasing them! To create your own WordPress site now, check out this thorough and easy 6 step guide to creating your new blog in under 20 minutes! This is one of the most important things to pay attention to when selecting a WordPress theme! Any well-developed WordPress theme will include both a Parent Theme (the framework) and a Child Theme (the site design – how your website will actually look!). However, often times, you will have to purchase the Genesis Framework separately from the Child Theme! Genesis can be purchased for a one time fee of $59.95 through StudioPress. The Genesis Framework, a Parent Theme, is by far the most loved of all with us WordPress users! It’s well-coded, well-supported, and features excellent built-in SEO! In the selections below, I have listed which themes do and do not include Genesis in their listed price (as well as noting if a frame was built on another framework, if the designer has disclosed this) 🙂 But please, always double check the listing again during checkout to confirm all information is still up to date! Pro Tip: For optimum SEO, speed, and security, among other things, it’s ideal to keep your site’s structure separate from its visual components. When browsing WordPress themes, you’ll often come across this term! A Responsive Theme is a WordPress Theme that adjusts its layout for optimum resolution based on the browsing device’s screen size. Responsive themes offer a better user experience in that navigation and readability are thus, “made to order” for the individual viewing your site. This is especially important when you consider the smaller dimensions of a mobile device like a smart phone or tablet! And bonus: instead of having to create and constantly edit a specific mobile version of your site, this is a one step solution! Ready to get started? Let’s find the perfect theme for your blog! The themes below range from $20-$65 and feature options for all different types of blogging niches. A responsive, feminine, and minimalist WordPress Genesis Child Theme. Perfect for Lifestyle Bloggers and Home Decor or Design Enthusiasts! Live theme customizer for changing colors, logo, favicon, etc. An absolutely gorgeous and feminine premium WordPress theme. Perfect for Beauty and Fashion bloggers! Three layout styles (full width, right sidebar, and left sidebar). Tons of post display styles (full post, excerpt, list, grid). Widget areas (Primary Sidebar, Homepage Header, Homepage Footer, Blog Page Header, Categories Page, After 1st, 2nd, 3rd, 4th, and 5th Post in Homepage, After Each Entry in Single Post, and Footer). A responsive and minimalist WordPress theme perfect for Influencers, Travel Bloggers, and Interior Designers. ✘ NOT built on and DOES NOT require Genesis framework. A very minimal and clean WordPress theme that is perfect for portfolios, creative blogs, and lifestyle bloggers! A feminine and responsive WordPress Theme catered to food bloggers, chefs, and recipe enthusiasts! A modern and feminine WordPress Theme built on the Genesis Framework. Especially perfect for beauty, lifestyle, and mom bloggers! A feminine and minimalist WordPress theme perfect for new bloggers or those with a fashion or mom blog craving simplicity! A chic and modern WordPress theme perfect for fashion, beauty, and travel bloggers as well as small business owners! This theme is compatible with both WordPress.org as well as a WordPress.com business account. Woocommerce ready. Easily setup a shop on your website. A fresh and feminine WordPress themes perfect for lifestyle, food, DIY, and home interior blogs! Lots of styling options : custom colors, more than 350 Google Fonts and logo. Ability to display your category posts in grid layout (3, 4 or 6 columns). Blog page with different layouts; 2 o 3 rows, pots scerpt + featured image or full posts. Widget area below post entries for subscription form, call to action, ads,..
Posibility to use the blog format instead of widgetized home page. Shortcodes: Image+Text, Video+Text, button, Pricing table, service boxes, call to actions,..
3 page layouts (FullWidth / content+sidebar / Sidebar+ content ). Widget area below post entries for subscription, text, ads,..
A minimalist and simple premium WordPress Theme with full support for WooCommerce. Perfect for interior designers, lifestyle bloggers, and those running a small business! A clean and minimalist theme perfect for photography, food, travel and lifestyle bloggers. Responsive and flexible layout matches and works on every desktop and mobile device. 2 Main layouts: Normal layout & First fullwidth, then list posts. A versatile, feminine WordPress theme ideal for a fitness or wellness blog but suitable for virtual assistants, coaches, or consultants! A lovely and feminine WordPress Theme perfect for the e-commerce business owner or a beauty, fashion, wellness or lifestyle blogger! A light and airy, effortlessly chic WordPress Theme that is perfect for beauty, mom, and fashion bloggers! A modern and feminine theme perfect for photography, beauty, and fashion bloggers! Customizer that lets you change some font colors, otherwise edits need done via CSS, theme comes mainly as shown. As the name states, a clean and simple WordPress Theme that is perfect for interior design enthusiasts and lifestyle bloggers! Easily add a rounded style Photo to your blog. A chic and minimalist theme perfect for travel and lifestyle bloggers. A floral and feminine perfect for mom and beauty bloggers! A Modern and feminine theme perfect for mom, wellness, lifestyle, and beauty bloggers! A stylish, magazine style WordPress theme perfect for lifestyle and travel bloggers! Responsive looks great on all devices! A minimal but chic theme perfect for interior design and lifestyle bloggers! As the name states, a chic and modern theme that was built for travel bloggers! A beautiful pastel and feminine theme that is perfect for fitness, wellness, photography, and lifestyle blogs. Lots of styling options : custom colors, more than 300 Google Fonts and header logo. Flotating left hand Sticky widget for adding Newsletter. Filterable portfolio and gallery lightbox to display your work (images, videos,..) in 2, 3 or 4 columns. Blog page with multiple layout options; 2 o 3 rows, pots scerpt + featured image or full posts. Woocommerce compatible, build your own shop. 3 page layouts ( full-Width / content + sidebar / sidebar + content ). A modern and minimalist WordPress theme perfect for creative professionals, photography, wellness, or lifestyle bloggers. A modern, feminine, modern and beautiful theme ideal for lifestyle bloggers & small shops! Have more than one blog? Or can’t decide on which theme you want to use? Save over $230 and buy 10 themes (including a few of the ones mentioned above!) for only $59! Did you find exactly what you were looking for all along? 🙂 Have you narrowed it down to how you want your blog to look? I’d love to hear from you in the comments below!